Touro University California is dedicated to educating caring professionals who will serve, lead, and teach in our local communities. We have established the TUC Fund to allow annual givers to contribute what you can in any amount per month to the future of this university. These consistent gifts are used to fund experiential training programs, community service engagement, and unanticipated student opportunities. If you prefer, you have the option of directing your gift to a specific area of study within the university. Whether you are an alumni, parent, or friend, providing a gift of support doesn’t necessarily require one large gift; a regularly given smaller gift can make an equally substantive impact. 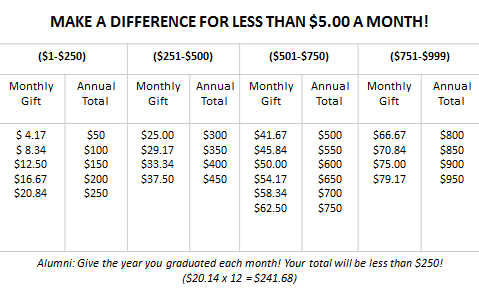 A monthly gift of less than $5 a month is all it takes to become one of TUC’s annual supporters. Support for the TUC Annual Fund benefits every student, every faculty and program, and every building. Our sincere thanks for every single dollar!